Simply stated, a MapPack is an area that you have designated that you would like TNP to keep permanently available for viewing. Once a MapPack is downloaded, the maps it contains will remain available even when TNP does not have an Internet connection available. Setting up an area as a MapPack is very easy. 2. Set the map type and edition (again, on the toolbar) to the desired content. For example, to create a MapPack of the most detailed and current imagery, set the map type to Satellite Imagery. 4. Give the MapPack a name. This could be the area of interest, or some other designation. Naming the MapPack with something memorable will come in handy if you need to update its contents, or to delete it to free disk space. 5. The Minimum Scale determines how much map detail you want the MapPack to contain. Minimum scales larger than 1:72,224 will not contain a lot of detail. Scales between 1:18,056 and 1:9,028 will contain detail sufficient for most applications. Scales of 1:4,514 down to 1:1,127 are really only useful when viewing the Satellite Imagery map type or occasionally using a Terrain/Contour Outdoor map type in an urban area. Set the Minimum Scale to fit your needs. Note that as more detail is requested, the size of the MapPack increases significantly. Thus, it is prudent to only download the minimum scale necessary for your application (and the type of map you are using.) 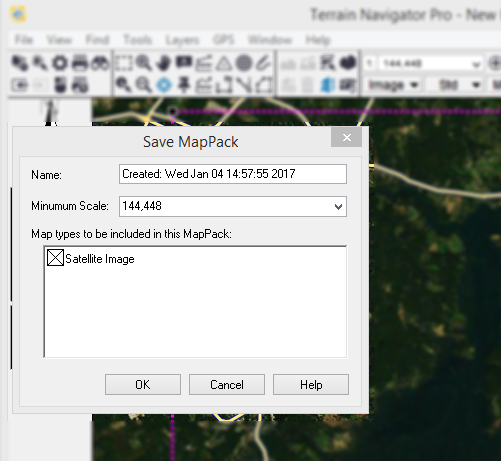 If the MapPack contains too much detail over too wide an area to be downloaded and processed within a reasonable time, Terrain Navigator Pro will present a message requesting that a smaller area (or less detailed minimum scale) be employed. 6. As the Minimum Scale is set, you may see different map types become available in the list of map types to be included in the MapPack. This is because not all map types are available at all scales. While the map types listed are required to view all the scales in the selected area, you can deselect the ones that you are not likely to use. Note that there is not usually a need to create a MapPack containing the standard edition "USGS Topographic Map". These are usually copied permanently to the hard drive during the installation process. Only create a MapPack of standard edition USGS Topographic Maps if this step was declined during the setup process. (If you want to ensure this is done, use File, Setup States and Regions to reinstall the state/region.) That said, MapPacks can contain the alternate edition USGS Topo Shaded Relief Maps; those are downloaded from the Internet and not included when the state is installed. 7. Press OK to save the MapPack. Be patient as Terrain Navigator Pro downloads all of the necessary maps and processes them for use. MapPacks covering large areas and/or very detailed display scales will take many, many hours to download. Here you can retrieve basic information about your MapPacks, as well as rename, update and delete them. Multiple MapPacks can be selected for updating (information, renaming, and deleting can only be applied to one MapPack at a time.) Press Close to exit the Manage MapPacks window. To review these MapPacks in the future, open the File menu and choose Manage MapPacks. Once created, MapPacks are loaded automatically. 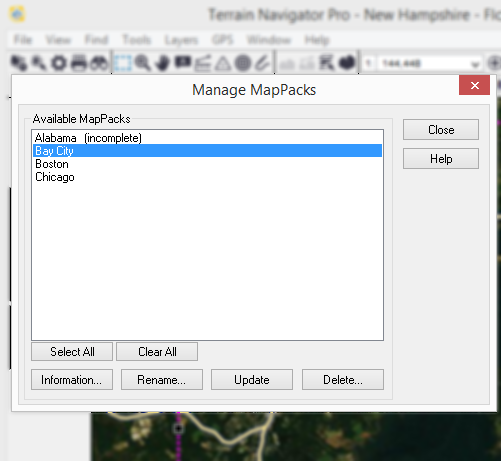 Whenever Terrain Navigator Pro needs a map for a specific area of interest, it checks the library of MapPacks first. Only if the map area is not already in a MapPack will TNP then proceed to download the necessary map tiles from the Internet. I keep getting a "MapPack Too Large" message. How do I make a smaller MapPack? The amount of map data (or "tiles") in each MapPack is determined by the amount of area covered and the minimum display scale. Simply put, a MapPack can contain a wide area at a less-detailed map scale, or a small area at a very detailed scale. For example, a MapPack (containing one map type) that covers a moderately-sized US state (108,000 square miles) could have a minimum scale of 1:18,056. A normal-sized US county (7000 square miles) will usually fit in a MapPack with a minimum scale of 1:4514. A MapPack with a minimum scale of 1:2,257 could hold approximately 1700 sq miles; a MapPack of 1:1,129 could hold approximately 400 square miles. Note that for most MapTypes, a minimum display scale of 1:18,056 is usually sufficient. Minimum scales lower than 1:4,514 is not recommended for Aerial Orthophoto Map Types. Only Satellite Images (and certain Outdoor Contour maps) truly offer map usable detail down to 1:1,129. What happens if I select an area that I've already downloaded? 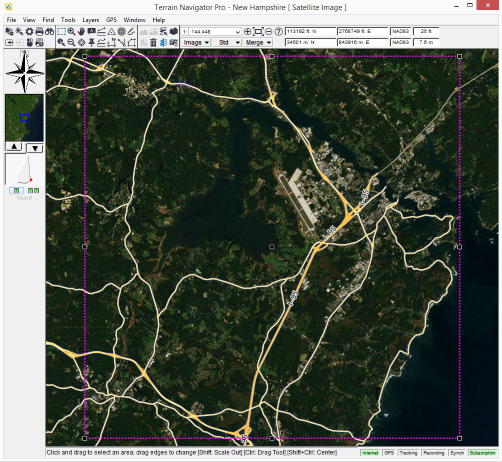 Terrain Navigator Pro does duplicate areas already downloaded into a MapPack. Thus, each MapPack builds upon itself, creating a seamless area of maps to use while offline. This is why the size on disk given in the MapPack window is only an approximation - it does not take into account other MapPacks that also contain the same map portions. Likewise, this is also why deleting MapPacks can take more time than one might expect. How do I "test" a MapPack? Is there any need to create a MapPack of the standard USGS Topographic map type? Usually, no. TNP automatically installs the entire library of traditional USGS maps for your state(s.) While you may see a slight increase in performance if they are also contained in MapPacks, there really is no need to do this. That said, we may offer TNP without the automatic installation of USGS maps – at which time, having them in a MapPack would be beneficial. That said, the alternate edition USGS Topographic Shaded Relief maps are downloaded from the Internet and, if needed offline, should be downloaded into a MapPack. What is the best way to use TNP offline? Before you go offline (or as soon as you start TNP without an active or reliable Internet connection) open the File menu, choose Preferences, Internet Access and Map Cache and uncheck the option to allow Terrain Navigator to connect to the Internet. This will ensure that TNP does not keep trying to connect to the web for data – saving much time and enhancing its overall performance. Once you are back online, open the File menu, choose Preferences, Internet Access and Map Cache and check the option to allow Terrain Navigator to connect to the Internet; restart TNP for any subscription benefits to take effect. How are MapPack updates handled? Map areas stored as MapPacks are not updated automatically. To update a MapPack, open the File menu and choose Manage MapPacks. Select the desired MapPack and press Update. TNP will then ensure that the MapPack contains the latest maps and images. Can I transfer a MapPack from one computer to another? Yes. Open the File menu and choose Manage MapPacks. Select the desired MapPack and press Export to save that MapPack as a single MapPack Archive (.mpa) file. Save it onto a USB thumb drive (or shared network location) for transfer to the other computer running a licensed copy of Terrain Navigator Pro (with an active annual subscription.) Once the file is available on the second computer, start its copy of Terrain Navigator Pro and choose File, Import, MapPack Archive to load the .mpa file saved from the other computer. Can I see the area covered by a specific MapPack? Yes. Press the Information button in the Manage MapPack window to see that MapPack 'selected' at it's minimum display scale. Also, the Find button will open the MapPack accordingly. Can I select a non-rectangular area for my MapPack? No. A MapPack is set by the rectangular Selection Tool. However, because MapPacks build upon themselves, select the largest area first (at the least detailed scale) then refine the areas into smaller and smaller chunks at more detailed minimum scales. Can MapPacks be accessed once the annual subscription has expired? No. Our licensing agreements with the various map providers do not permit unlimited use outside of the subscription period. However, they will remain downloaded on the hard drive; dormant until the subscription is reactivated. Note that this restriction does not prevent their use while the Internet connection is unavailable during the subscription period. Why was the "Copy Maps to Hard Drive" feature in older versions of TNP removed? 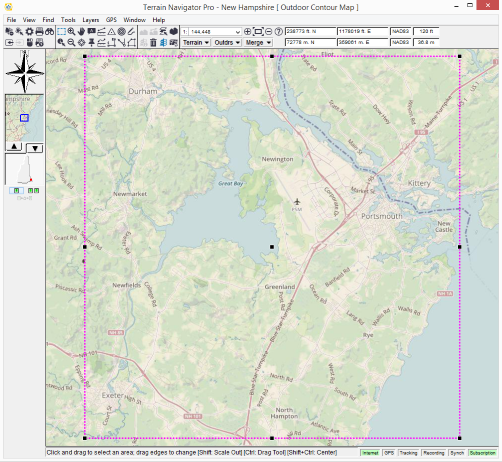 Version 11 of Terrain Navigator Pro departs from the 7.5" minute grid system imposed by the USGS. As modern, updated maps are now best available seamlessly via the Internet, TNP needed to be redesigned to accommodate this format. Thus, the "Copy Maps to Hard Drive" (and its cousin, the "Open Map" window) needed to be retired. Why does it appear that my previously downloaded aerial photos need to be re-downloaded? Note: This applies only to "standard edition" photos downloaded with TNP versions 9, or 10. "Alternate Edition" photos can not be displayed in TNP 11. What if I download the same area in different MapPacks? TNP handles this automatically. No additional disk drive storage is used. With each download, your library of maps available when offline will continue to grow. Thus, you need not be concerned if you have previously downloaded the selected map type at the minimum scale. Where are the MapPacks stored? Can I change this location? MapPacks are stored in a hidden system folder located on the same drive where Terrain Navigator Pro is installed. It cannot be changed. How do I know how big a MapPack is? In the Manage MapPacks window, press Information. The approximate size of the MapPack will be included there. Is there a video on how to create and manage MapPacks that I can watch?